Lucy Lighting Fortress Single Door Feeder Pillars are robust pillars providing low voltage electricity distribution for a variety of applications. The feeder pillars incorporate a high level of corrosion resistance to ensure durability and a long maintenance free life. A wide variety of Lucy feeder pillars are available. Lucy Lighting Fortress Single Door feeder pillars are available in 6 sizes in both mild and stainless steel. 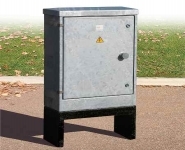 Mild steel feeder pillars can be obtained in two panel thicknesses with a choice of a hot dip galvanised finish or hot dip galvanising followed by paint. When ordering stainless steel feeder pillars, the customer can specify the grade of stainless steel and finish required. 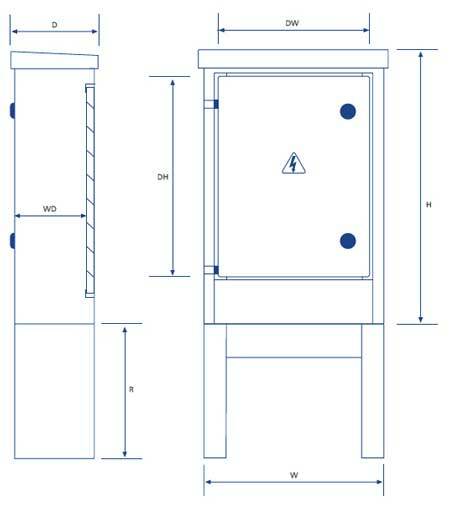 Lucy Lighting Fortress single door feeder pillars are available with following optional extras : internal gland plate, in fill panel for root section, yale lock, hasp and staple, heater kit, 13amp socket kit and lighting kit.